Marketing, Sales, Production, Management, Human Resource, Planning, Finance, IT, Engineers Mechanical, Electrical, Electronics, Call Centre Agents, Customer Services etc. 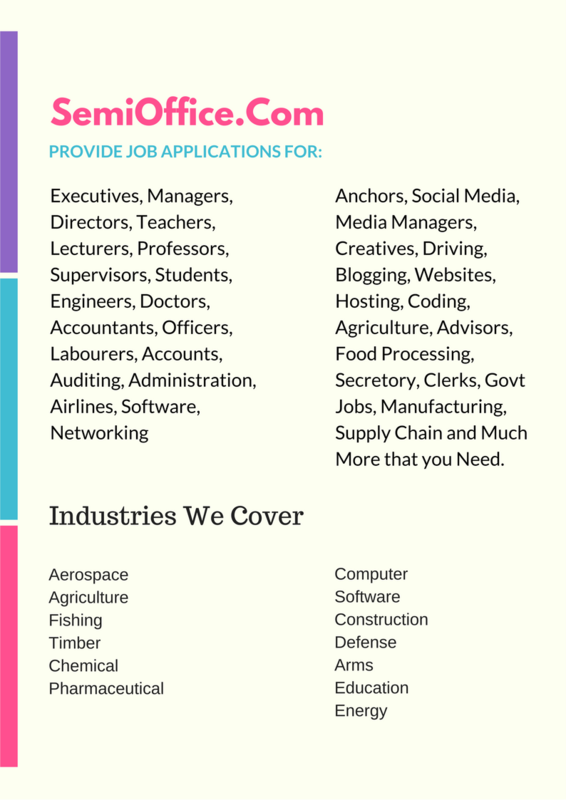 Job application formats are available for Executives, Managers, Directors, Teachers, Lecturers, Professors, Supervisors, Students, Engineers, Doctors, Accountants, Officers, Laborers, Accounts, Auditing, Administration, Airlines, Anchors, Social Media, Media Managers, Creatives, Driving, Agriculture, Pharmaceutical, Electrical Power, Petroleum, Medical, Advisers, Secretory, Clerks, Govt Jobs, Manufacturing, Supply Chain and Much More that you Need. or any other position. Job application templates are used to send resumes, apply for the vacant positions and to request for jobs if any vacancy is available. These applications normally sent as cover letter with the resumes to describe your skills and expertise in a very short paragraph. Job applications includes four sections. 1st section indicates that how you came to know about the vacant position. 2nd Section describe your specifications for the job including your qualifications, expertise and experiences. 3rd Section describe why the employer should select you for the job and it includes your working habits, interests, efficiency and nature. 4th section include a request for the interview call or call for the test leading to interview. These four sections must be included in any job application and covering letter to apply for the jobs. You must write a convincing job application letter if you really wanted to get hired and should match your expertise the the job description. We also provide consultancy for writing job applications for our website visitors. Please comment in the below section if you need any job application. We will post your required application as early as possible and let you know. I am Graphics Designer, and i want to apply job from another company, how can i write? Thanks, please send me application for nursing service. I highly appreciate your website. I can now boast on application letters. Please i love and would like to work with the government of the other African countries so help me with a nice and very good application letter with either a request or cover letter.Thank you very much. Plz plz send me the sample of job application for lab incharge. Hello. I’d like to kindly request you to add the Application letter for a “BANK TELLER”.Thank you. I could not satisfy. please send me application to work as a teacher in jean paul’s school for junior branch, Arrah, bihar. I want to pls send me a comprehensive business letters for all kind of positions. An application for the position of Chlorinator. Love to be a team member to AIU. Pls help. Please could u help me with a sample on how to structure a CV and a reference by a councillor.. Please send a sample on to address my audience in a gathering of at least fifty people, include the welcome address etc. Good information provided on your website.